You are here: Home » MEDIA » Books » Dayfall by Michael David Ares (book review). 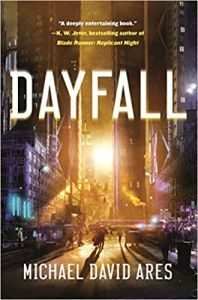 Dayfall by Michael David Ares (book review). ‘Dayfall’ by Michael David Ares is an odd book. A detective story that is pretending to be a Science Fiction. Detective Jon Phillips, working off duty, tracks down and stops a serial murderer. His boss is approached by the mayor of New York to reassign Phillips to capture a serial murderer there. He’s assigned to work with Detective Frank Halliday who is determined to note his Scots ancestry and has an annoying habit of calling all his work colleagues by nicknames. It’s amazing how Halliday has survived on the force for so long without someone taking him down a few pegs. What is supposed to be making this book Science Fiction is only revealed on the inside cover. It is perpetual night although day is due any time now. It isn’t revealed until the middle of the book that large chunks of Manhattan is also underwater and dinghies are needed in some areas. Groans should start here as such reveals should have come much earlier or how the world is in such a state. It can hardly be from nuclear fall-out or pollution as everyone acts as if things are perfectly normal and daylight is around the corner. How can plant-life sustain itself in perpetual night and how in the cities isn’t any reference made to how much light is ground generated? You might have a lot of lights on but you can’t light everywhere and there’s only a couple references made to hiding in the shadows. Reading, you can no idea of the condition and there is a lot of description of places to the point that it gets in the way of the story. Worse, Ares barely uses the reality he created other than that daylight is a few hours away and then it isn’t. On top of this, the story then switches from being a hunt for a serial killer to a political conspiracy. Either Ares was making the story up on the hoof or wanted to improve his ideas. None of which is helped by the way he throws away characters and plot by thinking something different would improve it. I hate coming down on an author like a ton of bricks like this but, although readable, you don’t really care much about what happens at the end which doesn’t make for this to be much of a book in any genre. « Stark’s Crusade (book 3) by Jack Campbell (writing as John G. Hemry) (book review).